I keep a deck of Tarot along with a reading book in the bathroom. I generally read a bit when I sit. Sometimes, I pick a Tarot card. Not for divination purposes, but to study. Rather than memorize what someone else says a card means, I SIT with them and gradually detect their meaning. Their meaning for me, anyway. So, as I was pondering on what to write on the next Astrology Course installment, The Star card XVII passed into my hand as I sat one morning. “Well, now, fancy that. How nice,” as my friend BBB might say. Here is how I read the card relevant to Astrology and recent installments. 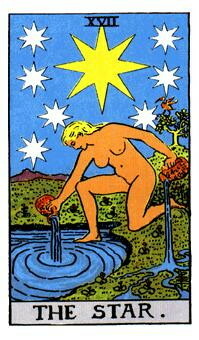 • Aquarius is usually pictured as a male figure. Maybe The Star card hints at how the Feminine principle will become more prominent in the coming millennia. Well, that was a Big Picture look at The Star card. How about from the human angle? • The large Star represents the Soul, that persisting part of our being. • The seven lesser Stars symbolize the seven chakras (centers of consciousness) through which the Soul expresses the seven parts of our nature, maintains and releases memory, and grows us from lifetime to lifetime. • The Water can stand for the bloodstream through which the higher forces of our Nature eventually color the physical. Next time, we will begin to consider how symbols lie at the base of horoscope reading - or can - and how central symbols are to self study and finding our way home.